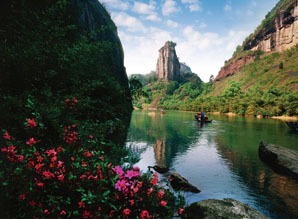 The Wuyi Mountains is one of the most spectacularly beautiful areas of southeastern China. Wuyishan Nature Reserve is well known for its abundance of deep canyons, dense forests, waterfalls, animals (many of them endangered), flora and fauna. It&apos;s an idyllic destination for any nature lover. It is open year round, but visitors can best enjoy the many wonders of nature during warm, dry days. Xiamen is subject to monsoon rains between June and September. During this period, the plants glow well and river is fuller. 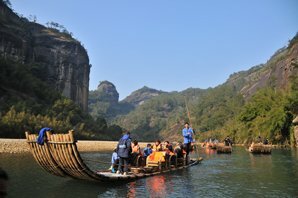 The Wuyi Mountains scenic area is divided into four core parts: the Nine-Bend River area, Wuyishan National Nature Reserve, Wuyishan National Scenic Area, and a special zone that houses important cultural remains of the Ancient Han Dynasty (206 BC – 220 AD). 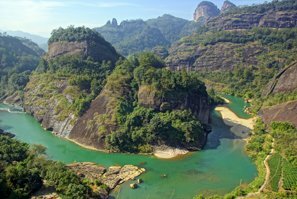 Whether you&apos;re interested in hiking, boating, bird watching, tea estates, waterfalls, cultural heritage sites, or simply want to explore a beautiful, pollution-free part of China, the Wuyi Mountain range offers something for everyone. Tianyou Peak (天游峰) is situated north of the fifth and the sixth bends of Nine-Bend River and covers an area of 4 square kilometers. With ever-changing cloud reflections in the water and sun shining through the fog, Tianyou Peak is the number one must-see spot in the Mt. Wuyi area. After rainfall or when dawn breaks, the ever-shrouding clouds allow only the tip of the mountain to be visible, hence its name Tianyou, which literally means &apos;roaming in heaven&apos;. The vista from the top changes with the seasons: blooming flowers during spring, dense greeneries during summer months, colorful fall foliage, and the beauty of the clouds in winter. Nine-Bend Creek (九曲溪) is the centerpiece of Mt. Wuyi. This river is aptly named, as it abruptly changes course nine times over its 8.5 square-kilometer region of the park. Two gorgeous waterfalls, known as the Green Dragon Waterfall and Phoenix Waterfall, are a particularly beautiful attraction. A few caves are located directly adjacent to the waterfalls, giving visitors an unparalleled view through the cascade of water. The Nine-Bend Creek is flanked on either side by mountain peaks and stones of unusual shapes that are interwoven with various watercourses. Each bend forms a unique picturesque and poetic landscape and each landscape has its own name. There are bamboo rafts for visitors. 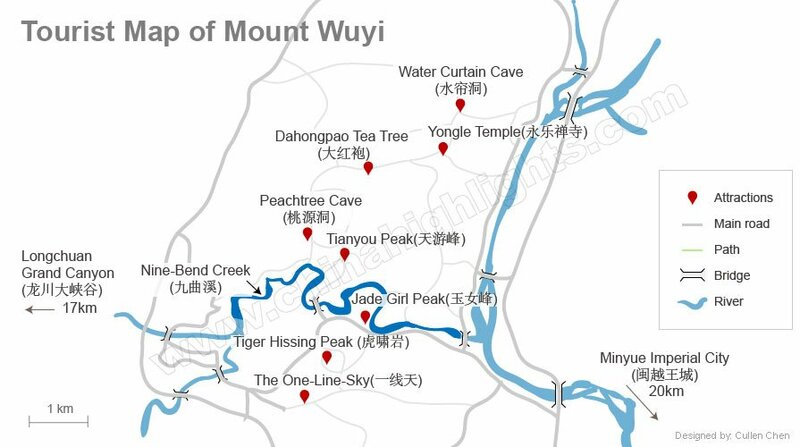 The One-Line-Sky (一线天) area is the southernmost area of the Wuyi Mountains. It is mainly a grand valley running from east to west. This area is famous for the linear view of the sky from the bottom of the valley. Blue Rock and the Pavilion Rock, opposite three caves, are also noted for their rugged beauty, steepness and diverse recesses. The red mountain peaks, clustering like a forest, the vertically steep Danxia landform (red sandstone), the rare consecutive caves and topography are nature&apos;s beauty at its best. 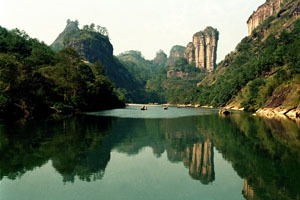 Tiger Hissing Peak (虎啸岩) is one of the 36 famous mountain peaks of the Wuyi Mountains. It is very steep and detached from the other peaks around it. The mountain is in the shape of a roaring tiger. Sounds resembling tigers&apos; hisses can be heard every time the wind sweeps through the pine forest. Legend has it that a deity rode on a tiger inside the mountain. Tours generally circle Tiger Hissing Peak, with beautiful scenes around each bend of the rocks. Water Curtain Cave (水帘洞) is the largest cavern in the Wuyi Mountains. Deep valleys form cracks among huge rocks of various shapes and sizes. Creeks and waterfalls run through the cracks. Pine trees, bamboo forests and various flowers abound. 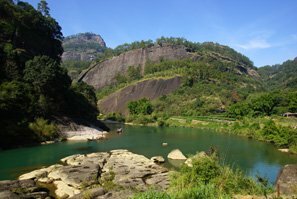 The spaces between rocks and the brooks are where the famous Wuyi Rock Tea trees are planted. A dense cluster of these tea trees are scattered in Nine Dragon Cave, nourished by water from the springs. Wuyi Rock Tea is a famous Chinese tea. Some tearooms are located inside the cave. 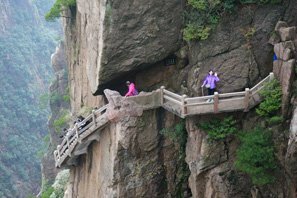 Longchuan Grand Canyon (龙川大峡谷) is 21 kilometers from the Wuyi Mountains Entrance and 18 kilometers from the core area of the preserve. This canyon world is a realm of mountain peaks, gardens, and waterfalls. There are various species of animals and birds. Ancient trees with giant vines entwined thrusts into the sky. Elegant waterfalls cascade along the rugged surface of the mountains; their silvery curtains bouncing off the rock and reflect the colorful sunlight. The waterfalls give a poetic touch to the picturesque landscape. Well-ensconced inside the sixth bend of Nine Bend River, Peachtree Cave (桃源洞) is surrounded by mountains on all four sides. Inside, water flowing under the bridge makes musical footnotes. This secluded cave, with green bamboos groves, peach orchards, and gurgling springs, is like "China&apos;s Neverland" as imagined by Ming Taoyuan, a Chinese famous ancient poet. 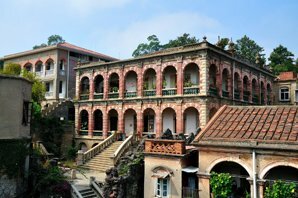 It is also an ideal place for Taoist disciples to worship and practice their religion. In 1995 the administrators of the temple and Wuyi Mountain Scenic Area cooperated in creating the biggest Saint Laojun sculpture to honor the founder of Taoism. Containing relics, shrines, and other monuments built in the Han Dynasty (206 BC – 220 AD), visitors to this area of the park can connect with this important part of China&apos;s history. Evidence shows humans have been living in the area for more than 4,000 years, and the ancient city of Chengcun, once the capital of the Minyue Kingdom, is in this area. Minyue Imperial City (闽越王城) is at the southern of Mt Wuyi. It is hugged by mountains on four sides and caressed by meandering streams. 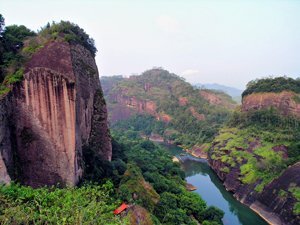 It is 20 kilometers away from the Wuyi Mountains entrance, but an important part of the Wuyishan World Heritage Site. The Minyue State (~334–110 BC) existed from the Warring States Period till it was absorbed by the Han Dynasty. 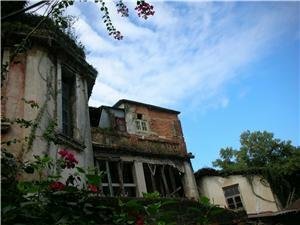 The Relics of Minyue City cover 48 hectares. There are scenes typical of cities in south China. It was dubbed the “first city for archeologists in south China”. Main attractions include the history museum where the Minyue culture, and others that spanned thousands of years, are on display. "The first well of China", built for the emperor in the early Han Dynasty, and some villages in Ming (1368–1644) and Qing (1644–1911) styles. Songs and dances are performed there to showcase the ancient Minyue State. "Every brick tells a story and every tile sings a song." There are no cable cars in the Wuyi Mountain area, but the mountains there are quite easy to climb, so hiking is the best way to enjoy the beautiful views. There are clear signs along the way for you to get from one sight to another. We kindly recommend the following three hiking routes to you. After you&apos;ve climbed Tianyou Peak, you can hike down in a different direction to Taoyuan Cave. There is a beautiful temple in the Taoyuan Cave area. After you leave Taoyuan Cave, you can turn right to Xingcun Village, and cross a bridge to take the raft. Or you can take the tourist bus from there to other sights. Though the two sights may seem boring, the scenery on the way is the most beautiful and less crowded. This hiking route is almost all downhill and suitable for all ages. You can hear the sound of stream along the way. The scenery is less beautiful than the other two routes, but if you have time it’s worth seeing. Turn right at the standing Bodhisattva for the path to the One-Line-Sky area. If you’re short of time take the tourist bus between these sights. The nearby airport of Nanping Wuyishan gives visitors direct access to the town and park. Visitors can take a taxi from the airport to the city of Wuyishan, the distance being just 9 kilometers. Taxis charge 10 yuan for the first 5 km and then 2 yuan for every additional kilometer. Several trains connect the park from the cities of Xiamen and Fuzhou, as well as G trains from Beijing and Shanghai. A public bus operates inside the park (number 6), but most of the important sites are within walking distance of one another. Not interested in the above tours? Our tours can be tailor-made. 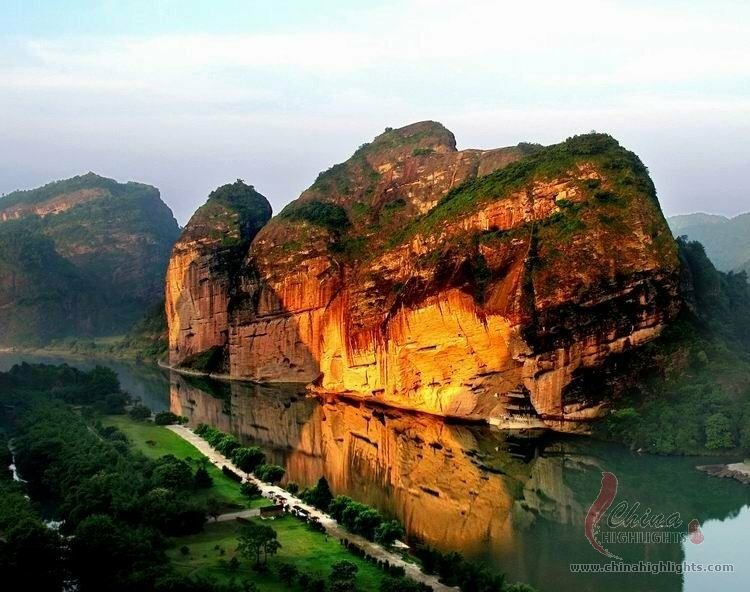 Just tell us your interests and requirements, and we will create a perfect Wuyi Mountain tour for you.